With the Space Shuttle program nearing its end of life, the most economical options for transportation to the International Space Station (ISS) are: 1) sending taxpayer dollars to buy seats on the Russian Soyuz, or 2) investing in the American commercial space industry. Commercially procured crew and cargo services to the ISS do not compete with the Constellation Program, which is under development to explore beyond low-Earth orbit (LEO). NASA, Congress and numerous Presidential Directives have consistently supported acquiring commercial crew and cargo services to the ISS. Commercially procured crew transportation is an alternative to paying Russia to launch our astronauts to the ISS. As pointed out at the Senate hearing the following day, even if NASA receives significant additional funding, only commercially procured crew and cargo services to the ISS allows its extension to 2020. The lower cost of commercially acquired transportation to the ISS will allow NASA to focus its resources on the Constellation program for exploration beyond LEO. Commercially acquired crew and cargo services will use existing launch vehicles and those already under development, which the U.S. government already entrusts for carriage of high-value national security and scientific assets. 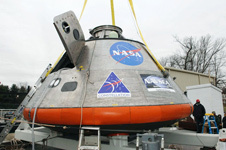 NASAâ€™s Commercial Crew/Cargo (COTS) program is on budget and has met numerous schedule milestones. For a full copy of the â€œAcquiring U.S. Commercial ISS Crew and Cargo Services Creates New Industry in LEO, Enables Program for Exploration Beyondâ€ White Paper, please visit www.NextStepInSpace.com.